Good boots can be found at a bargain. 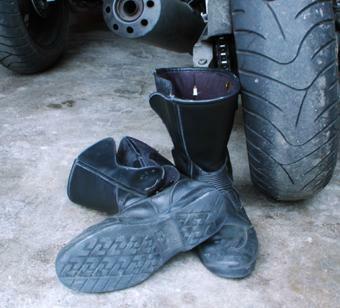 The hog and the leathers are expensive, so you want to save some cash where you can and that's why you go shopping for discount motorcycle boots. You don't have to compromise on quality to get the boot you need, you just need to be a little patient. The best discounts can usually be found at online shoe stores, especially if you're looking for something at least a year old. Start with Discounted Boots, which has a good selection of popular boots in all the best brands, including Harley Davidson, Chippewa, Wesco, Carolina, Honda, and Double-H. Their styles include harness and engineer boots, lace-up boots and lineman boots. If you're looking for something specific and don't see it listed, you can email or call them with your request and they will do what they can to assist you. They currently have two pages of quality boots available and since the shipping is free, you save even more money buying from them. Leather Up is obviously a good outlet for leathers, but they have men's and women's boots at either 50% off the suggested retail price, or even lower. Their selection for men consists almost exclusively of Xelement boots, of which they currently have over forty styles from which to choose, and a few Bed Stu boots. For women, the styles are more limited, but they have Xelement and Harley Davidson boots at very low prices. You can also sign up for Bargain Alerts, guaranteeing even better prices and selections. They have a flat shipping rate of $7.95 and a no-risk 30-day exchange and return policy. Riders Discount has a great selection of men's and women's boots. This is another specialty shop, which can be useful if you need assistance. They separate their stock by street and offroad gear and carry such brands as Joe Rocket, Teknic, AlpineStars and Icon. Shipping is free on any order over $100. Rockin Leather will offer discounts up to 70% off and carries Harley Davidson, Justin and Ariat, among others. They're one of the few sites that have a section specifically for children's boots, and if you have a little hog rider, you definitely want to save money on his or her boots, because those little feet will shoot through even a steel toe in no time. Their shipping rates are very reasonable with a top rate of $8.95. You know the rule with shopping for shoes on eBay, "caveat emptor," but if you work with a site like Best Motorcycle Gear, you can sidestep a lot of nonsense and get to some excellent deals. The site designer brings you live auctions organized specifically for motorcycle riders so they can find what they are interested in quickly and easily. The products open in a new window, so that you can review them in more detail. Obviously, you must still be aware of the risk factors, but this is an efficient means of getting to better auctions and thus, hopefully, better discounts. While you're always going to find the best selections at stores geared specifically to motorcycle gear, you can also find boots at low markdowns at shops like DSW, Shoe Pavilion or Nordstrom Rack. This is very hit-or-miss, but when you're looking for something and happen to pass one of these shops, it's worth it to duck in and see what treasures might be found.